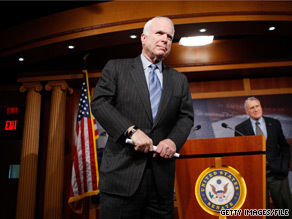 Sen. John McCain addressed his home state's controversial immigration law on Monday. Washington (CNN) - Sen. John McCain defended his state's controversial immigration law, arguing Monday on the Senate floor that Arizona needed to approve the tough new measure to ensure the safety of its citizens. "This situation is the worst I've ever seen," declared McCain. "If you don't like the bill - the legislation that the legislature passed and the governor signed in Arizona, then carry out the federal responsibilities, which are to secure the border." McCain is locked in tough primary battle, and immigration has become a central issue. He recently released a 10-point plan for the federal government to tighten the Arizona-Mexican border. It calls for the completion of 700 miles of fencing and assigning 3,000 National Guard troops to the region. "This is a struggle on our side of the border for the fundamental obligation that any government has, and that is to provide its citizens with secure borders. Right now our citizens are not safe," he said. Signed into law on Friday, the Arizona measure requires police to determine whether a person is in the United States legally, and immigrants will need to carry their alien registration documents at all times. Critics say the law will lead to racial profiling, a notion both Arizona Gov. Jan Brewer and McCain dismiss. One critic, former Rep. J.D. Hayworth, is now forcefully challenging McCain in the Republican primary, highlighting his opponent's prior support for comprehensive immigration reform. Hayworth is running to McCain's right and showcasing their differences - past and present - on the issue. Senator McCain, as a Democrat, I have often spoken up to defend you as an American Hero and I still respect what you endured in the service to your country. I am, however, not one of your supporters. While I have given you much respect, some of it was lost when you chose the "Vanilla Thriller from Wasilla". I have now lost the remaining respect I had for you as I see you now as nothing more than a man willing to do whatever you have to do to be a US Senator. You sold the little soul you had remaining for votes and with that you got the last good words ever to cross my lips about you as a man. Those words are: " GOOD RIDDENCE TO YOU AT THE END OF YOUR TERM". Good for John McCain. This is your do nothing spend everything Obama led Democratic party at work. They will jump all over this issue trying to make political hay with the Latino base –while they do absolutely nothing to safeguard our borders; address illegal immigrant crime; and tackle the problem of 30 million illegal freeloaders in the US taking jobs from Americans and using free services and paying nothing. Even Obama's own Aunt, in this country illegally, is living in a government sponsored subsidized housing unit. I can see it now a robbery happens, a girl gets raped, a drunk does a hit and run. And no witness will come forward to tell the police because they could be arrested for not having a passport or birth certifacate with them. An exchange student could forget their pappers at their dorm and the punishment would be 6 months in jail. Welcome to the land of the free. People seem to miss the point – these are 'illegal' immigrants – not people coming to the USA to obtain citizenship. How fair is this to let any and every one in illegally to the people who come here work hard and apply for their citizenship? You certainly cannot sneak across the border into Mexico. McCain has a good point. The only government that can secure the boarder is the Federal government.